What started as a vague idea at a family birthday party in October 2011 became reality when Friendly Stitches Sew and Vac opened its doors on May 1, 2012. Jon Hoekema, pastor of Horizon Community Church, and Ellyn Nicodem, having just come from 28 years of retail experience, discovered a need for an enjoyable and reliable place for people to buy or service sewing machines and vacuums at fair and honest price. They also envisioned a store that would interact with and benefit the community. In order for that to happen, they knew that they needed the right people, people of good character with experience in this field and found it in Mary West and Karen Hatley for sewing and embroidery. 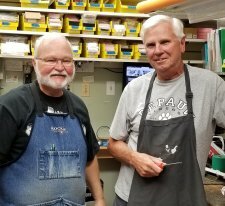 Bill, Al and Jim are all certified repair technicians have taken over the service of the sewing and embroidery machines while Jon takes care of the vacuums. Our people have many years of experience with sewing machines and vacuum cleaners, having used them, sold them, trained on them or repaired many different makes and models. As our name indicates, we are a friendly, cheerful place to do business, and our many customers will attest to that fact. We do our best to make you feel welcome. We carry quality products on which you can depend, but more than that, we have the expertise and willingness to help you. We want you to come in and talk to us about your needs so that together we can find the best solution for you. That is one of the reasons why we do not sell new sewing machines and vacuum cleaners over the internet or the phone. Our classes and events will help you with your projects and help you get the most from your sewing, embroidery or quilting machine. We want to help you to become the best at what you do, whether it is embroidery, quilting, making clothes, or just tailoring clothes to fit.